A layer of Odense Almond Paste between the Challah bread makes this Bananas Foster extra delicious! For ease of entertaining; arrange this tasty French toast casserole the night before, and pop it in the oven the next day. It’s the perfect brunch recipe! This classic 1920’s dessert is ‘technically’ neither a cookie, nor a pie but a small cake with a sweet center layer. Odense Almond Paste gives this famous treat additional flavor and texture. Yum! This pie is extra delicious with the combination of sour cherries, dried cherries and an Almond Paste lined pie crust. We jazzed up this classic anise-flavored cookie with Almond Paste and almond flour. It created a fabulous combination! Oil replaces butter for a super moist cookie! Different colored nonpareils or sprinkles can be changed up according to season or occasion. Almond and anise team up for an old world flavored scone. These scones would make a delicious addition to any special brunch or breakfast. Odense Almond Paste gives the tart apples and sweet cream cheese a deliciously rich flavor. Not as much work as a pie, this crisp recipe is truly delicious. Almond Paste makes the crumb topping extra rich and yummy. Enhancing your apple pie with Odense Almond Paste will make our recipe your new favorite. Grated Odense Almond Paste adds a delicious taste and texture to this apple and maple flavored granola. Use as a breakfast cereal, snack, or even as a topping on yogurt or ice cream. The addition of one thin layer of Almond Paste makes a great apple pie ... extraordinary! Odense Almond Paste and homemade pie filling makes these pops extra special. These delightful bites are great for kids and adults alike … think picnics and parties. This is a pie for all seasons and feeds a crowd! Bake it for picnics, family gathering or any function. Almond Paste and oats in the crumb topping are the perfect complement to apples. Almond Paste adds a moist richness to these delightful scones. It also provides a delicate flavor base for sweet apricots and spicy crystallized ginger. Chopped apricots with almond paste are a delicious combination. Odense Almond Paste makes this fabulous banana bread extra rich and moist. Yes, it is spelled Banket – an almond paste filled pastry from Holland. This pastry is sometimes referred to as a ‘Banket Letter’ because the long rolls can be shaped into letters of the alphabet. The flavor of fresh strawberries and raspberries are heightened by the addition of Odense Almond Paste. It’s ‘berry’ fresh tasting! Sweet Almond Paste and tart blackberries combine to make an irresistible coffee cake. Whether fresh summer blackberries or frozen ones in the winter, this cake is a crowd pleaser! This ‘blondie’ bar’s rich caramel and almond flavors set it above the crowd. This old fashion cake is a breeze to make! The addition of Almond Paste brings it to a new level of flavor. It's a wonderful dessert for tea or brunch. For an extra treat, serve it warm with whipped cream. Almond Paste and blueberries make an irresistible coffee cake. When fresh blueberries come in season, pull this recipe out! Odense Almond Paste goes particularly well with cream cheese and blueberries. Odense Almond Paste and lemon give these delicate scones a rich flavor. 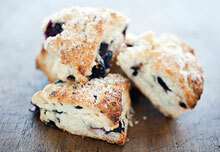 This recipe makes plenty of scones, perfect for breakfast, brunch or teatime. This recipe was an all around favorite in our Odense Recipe Contest. Many thanks to Lillian for her winning recipe! Odense Almond Paste gives this delicious butter cookie a shortbread crispness. It makes the perfect cookie for cutting into festive shapes and decorating. Once you make homemade pancakes, you'll never want to use a box mix again and the blender does all the work! The addition of Almond Paste and oats makes these pancakes high in fiber and flavor . . . think brunch. These pretty pops will delight young and old alike. Odense Almond Paste is the magic ingredient that sets these pops apart from the rest! This stunning, 4 layer cake was developed for us by Sarah Kieffer of The Vanilla Bean Blog. She loved how the Odense Almond Paste made the cake rich and full of almond flavor. Crunchy almonds, bits of chewy Almond Paste, and colorful candy corn make this candy festive, as well as delicious. Almond Paste makes this ricotta pie extra rich and flavorful. A blender creates an extra smooth pie and mini chocolate chips give it an authentic cannoli touch. This sweet cookie is perfect for macaroon lovers. Formed into canoe shapes and filled with jam, they're great fun for all, especially the canoe or kayak enthusiast. Odense Almond Paste gives this braided bread a rich texture. It’s a special treat for any holiday or tea time. The addition of Odense Almond Paste gives this cake a subtle almond flavor and a rich and dense moistness. For the finishing touch, top with Marzipan Carrots. Mayonnaise cakes were the creative genius of homemakers during the depression when butter, eggs and milk were hard to come by. Adding grated Almond Paste to the mix creates an even more moist and flavorful cake. Delicious! Odense Almond Paste and chocolate chips are a match made in heaven. This recipe makes six seductively rich, soft-centered cakes. They're perfect for special occasions. No need to tell your company how easy these elegant cakes are to prepare. Our rich cinnamon almond filling makes store bought dough taste homemade. Shredded coconut and Almond Paste give this cake a rich texture and taste. Frost with whipped cream, or simply dust with powdered sugar. This refreshing pie is a cross between lemon curd and coconut custard, with the additional flavors of almond. Serve it cold on a hot day! This is a festive and delicious dessert for your holiday table. Odense Almond Paste is in the chocolate crust and cream cheese filling for extra flavor! Grated Almond Paste gives this crumb topping an extra edge on flavor! These old-fashioned Dutch cookies are called Gevulde Koek, which means stuffed biscuit. We love the delicious contrast between the chewy almond center and crisp, shortbread crust. These rich yet delicate cookies will be an instant hit wherever you take them. Crystallized ginger and lemon team up with Odense Almond Paste for a dynamic trio of flavors. Molasses, ginger, and almond. All the flavors of the season in one adorable, gift-able bundt cake. Almond Paste, honey and lemon team up for an extra special moist and flavor filled cake. Its shiny glaze makes for a beautiful presentation. Odense Almond Paste makes these classic, horseshoe-shaped macaroons extra delicious. We used almond flour to make them totally gluten-free! We added Almond Paste and spices to this traditional Easter bread; making it a richly flavored, densely textured bun. We think these buns are too delicious to be relegated to a season. They make a tasty breakfast or brunch treat any time of the year. Danish Almond Paste complements the fruit and nuts in this traditionally Jamaican cake, giving it an incredible depth of flavor. Grated Almond Paste makes an extra moist Irish soda bread and combines wonderfully with caraway for excellent flavor. This buttery, sugar cookie is made even richer with Odense Almond Paste. The chocolate is just an added bonus! Step aside lemon bars; we have an even cooler version of summer bars. Odense Almond Paste makes a sweet quintessential crust for this tart and refreshing filling. The Linzertorte is thought to be the oldest cake in the world, with a written recipe dating back to 1653. It’s a staple at Christmas in Austria. We’ve updated this delicious tart using Odense Almond Paste. Odense Almond Paste gives these French cookies a rich almond flavor and perfect texture. Bake these unique treats for gifts or special occasions. Almond Paste gives these light and airy meringues a toasted nut flavor. 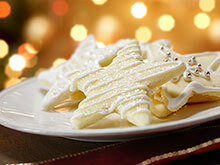 They are perfect for topping with whipped cream and favorite fruits. It takes less than a half hour to make these elegant desserts, and then the oven does the work. Odense Almond Paste adds a whole new flavor to traditional mincemeat pie. A layer of Almond Paste processed with chocolate covered espresso beans gives this classic dessert a surprise layer that is divine! We updated this 1950’s recipe by making a rich creamy sauce with Odense Almond Paste, which makes a sweet caramel-like coating. Thawed frozen bread dough makes this an extra easy recipe to prepare. Crystallized ginger and Almond Paste create a magical combination of flavors. Pure Almond Paste and fresh nectarines partner for a great summer dessert. Updating a traditional oatmeal cookie recipe, we added Odense Almond Paste and substituted raisins with peanut butter chips. An outstanding cookie. The flavors of Almond Paste and orange make for a delectable moist muffin; perfect for breakfast or an afternoon tea. We added Almond Paste to this classic French pastry for a delectable taste. Also known as palm leaves or elephant ears, these crispy caramelized pastries are perfect with coffee or tea. Peaches and almonds are as good as peaches and cream. For an extra treat serve with vanilla ice cream. Almond Paste complements pears and cranberries for this seasonal pie. This almond tart can be made with fresh pears or canned, depending on time restrictions and season. The sweetness of the European frangipane filling complements the subtle flavor of pear. This delicious, Odense pound cake is one of our most requested recipes. This sophisticated dessert is definitely a crowd pleaser. Sometimes known as "tipsy parson" or "drunken cake", we substituted the classic sherry for an almond liqueur. For a speedy trifle, bake our Almond Pound Cake and toast the almonds the day before. Odense Almond Paste and pumpkin make a spectacular cheesecake. The gingersnap crust gives it a festive flavor. Odense Almond Paste adds new flavor to an old favorite. It’s simple to make a flaky and flavor filled strudel with frozen puff pastry and almond paste. Apples and raspberries cooked together produce a lovely sweet and tart combination. A tasty layer of Odense Almond Paste accentuates their flavors. This braided bread is perfect for any special occasion. Sweet peaches and tart raspberries make a dynamic flavor combination when paired with Almond Paste! Almond Paste and raspberry jam spread on puff pastry make for a quick and elegant dessert. It's a perfect pastry for a holiday brunch or special tea party. This recipe can be easily halved for smaller gatherings. Classic Red Velvet Cupcakes get an Odense Almond Paste makeover for an extra special treat! We added Odense Almond Paste and almond flour to this traditional cookie for extra richness! It’s a favorite among our staff! Cut this delicious shortbread dough into any shape for any holiday. Split these stars with a serrated knife and fill with whipped cream, strawberries and blueberries for a festive dessert. A classic Snickerdoodles recipe gets a modern makeover with the delicious flavor of Odense Almond Paste. We think you’ll like this new treat. Crisps are much easier to make than pies and every bit as delicious. For the quintessential spring dessert serve warm topped with vanilla ice cream. These mini strawberry shortcakes are perfect if you're serving a crowd. Sweet strawberries layered between whipped cream and almond shortcake make a divine dessert. We didn't think strawberries and rhubarb could get better . . . until we added a layer of almond paste to this classic combination. 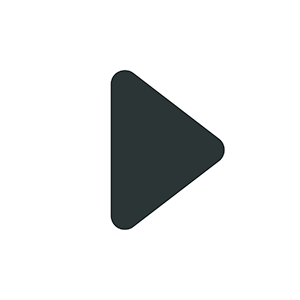 Try it, and see for yourself! These little cakes are precious with varied shades of the same color. Try pink for Valentine’s Day or a girl’s baby shower, or purple for Easter. The sky’s the limit for this delicious Odense Almond Paste tea cake. There are a lot of steps but well worth the effort! Odense Almond Paste gives this classic cookie an extra rich flavor and moist dough. Apricots and chocolate chips are cradled in a buttery crust and topped with a rich almond filling. The Odense Almond Paste does double duty in this recipe, flavoring both the sweet pastry crust and the filling. Change things up by adding Almond Paste to your old yellow cake recipe- the added flavor is nothing less than divine. Sweet Odense Almond Paste complements tart lemon in this rich and moist muffin. Almond Paste makes this bar extra dense and rich. Packed with nuts and fruits it is especially good for lunch box snacks or back packers. This bread pudding has an appetizing middle filling of diced apples and grated Almond Paste. It’s a hearty breakfast dish made with raisin bread for extra flavor. Serve with powdered sugar or maple syrup. This square makes a perfect lunch box treat or after school snack. It is filled with the tasty and natural goodness of almonds, apples and oats. Grated Almond Paste gives a convenient baking mix a homemade taste. This easy to prepare recipe feeds 8-10 hungry apple lovers, with all the mouth-watering flavors of fall. Pandowdy is a 19th century recipe of spiced apples covered with a biscuit type batter or crust, which is cut and pressed into the apples (“dowdied”) half way through baking. Before adding the crust, we topped the apples with a layer of Almond Paste for an extra special treat. Odense Almond Paste makes this a moist and satisfying muffin for any time of the year. Odense Almond Paste, apples and apple cider make the perfect combination of flavors. These delicious cake-like donuts are less messy to prepare than their fried counterparts. Odense Almond Paste, blueberries and buttermilk team up for a divine combination of flavors. These delicious cake-like donuts are less messy to prepare than their fried counterparts. These delicious cupcakes take advantage of the berry season. Tart berries refreshingly balance the sweeter flavors of white chocolate and Almond Paste. Odense Almond Paste helps create a yummy topping for these berry bars. Raspberries can easily be substituted for blueberries. This galette is easier to make than a pie and is a perfect summer dessert. It only takes 10 minutes to prepare and Odense Almond Paste adds a new dimension of flavor. Lemon zest, blueberries and Almond Paste make a moist and memorable muffin for any brunch or breakfast table. When summer blueberries are plentiful and inexpensive, this is the ideal pie to make. The combination of Almond Paste, oats, and lemon superbly compliments the sweetness of the filling, adding texture and eye appeal. Rhubarb and blueberries make the perfect blend of tart and sweet flavors. The addition of Almond Paste makes it even more splendid. Dark brown sugar and Odense Almond Paste create a rich tasting, caramelized almond flavor. It's hard to believe a cake so rich can be made without butter. We think you'll agree, with a minimum amount of effort, this cake delivers a maximum amount of flavor! A new and tasty twist on an old classic. This tasty, moist cake has the flavor of a Swedish braid, but is half the work. Cardamom has a spicy sweet flavor and is a member of the ginger family. Odense Almond Paste and dried cherries soaked in almond liqueur give these pretty biscotti an extra special depth of flavor. Sweet Almond Paste and cherries are perfectly balanced by tart rhubarb. This banana bread tastes good enough to be a cake! Odense Almond Paste and dark cocoa powder complement the rich flavor of bananas in this ultra-moist quick bread. It’s a match made in heaven. Serve warm with chocolate almond chip ice cream and chocolate syrup for a real down home dessert. These rich scones are much more of a dessert scone than a breakfast one. Serve with fresh strawberries and whipped cream or a bowl of raspberries for a refreshing summer treat. These delightful rolls are reminiscent of 'Pain au Chocolat' with the delicious addition of Almond Paste. Refrigerated crescent rolls make this an easy recipe to prepare. Odense Almond Paste is a natural with chocolate. This is a great cookie for any occasion; just use the right cookie cutter, according to the holiday! Our testers thought this cookie was a delicious cross between a biscotti and a brownie. Either way it's the perfect balance of chocolate and almond. Great picnic packers or hostess gift! Salty, sweet, and decadent. Odense Almond Paste makes these bars the perfect indulgence, and they feed a crowd! This easy quick bread is perfect for breakfast or brunch. Almond Paste and dark cocoa are combined to create a richly flavored filling that is layered in a luscious quick bread. This rich tasting, extra moist cake is an all-time family favorite from the Odense collection. It's perfect for a tea or packed up for a picnic. If you love Almond Paste, deep rich chocolate and coconut, these cookies are for you. The combination of Odense Almond Paste with coconut, and a decadent chocolate center, makes this cookie reminiscent of an Almond Joy! The mix of almond paste and cocoa is a match made in heaven. Almond Paste and pistachios give that ever popular sweet and salty flavor to this easy to make fudge. Chocolate Macaroons made with Odense Almond Paste will find their way onto your favorite cookie platter for any occasion. Almond Paste adds another dimension of taste to this classic flavor combination. It's a great cake for any occasion. We made this complicated pastry easy to prepare with Almond Paste and store bought puff pastry. This light and airy cake is infused with the subtle flavors of lemon, orange and almond. It's the perfect cake for a crowd. Dress it up with a fancy frosting, seasonal fruits or simply serve as is. Odense Almond Paste adds a rich almond flavor to these crunchy, nutty tasting biscotti. They make the perfect hostess gift for any occasion. One of our most requested recipes. We've combined the flavor of Odense Almond Paste with dried tropical fruits for a taste of the islands. Melted Almond Paste and marshmallows team up with crispy cereal and coconut for an unbeatable taste that will delight kids and adults alike. This pie combines the two classic autumn flavors of apple and cranberry. Sally’s Baking Addiction used Odense Almond Paste to develop this recipe and features it on her blog. Check it out here and fill your kitchen with the aromas of the holidays. Sweet Odense Almond Paste combined with tart cranberries and oats make these squares a flavorful breakfast treat, or snack. Sweet Odense Almond Paste combined with tart cranberries makes this an extra moist and flavorful cake. Odense Almond Paste combines with classic festive flavors to make this delicious holiday cookie. Oats give heartiness to this festive cookie. Odense Almond Paste combined with the addition of cranberries and orange rind make a classic flavor combination. Cranberries, white chocolate chips and Odense Almond Paste make a classic combination. The addition of orange zest gives this cookie a tasty flair. A galette is a free-form tart that can be sweet or savory. We have paired sweet pears and tart cranberries with Almond Paste for a fall celebration of flavors. Grated Odense Almond Paste makes a sweet almond topping to cover tart Granny Smith Apples. It’s super easy to make, with no bottom crust and a topping that’s spooned on. A rich and moist coffee cake with a delicious almond filling. It's a treat any time of the year. These classic butter cookies are made extra rich and delicious with the addition of Odense Almond Paste. This delicious bar has two layers. The top layer is a rich, sticky-sweet almond topping that has the texture of a pecan pie. It sits upon a contrasting almond shortbread crust. It is delightfully indulgent. Almond Paste plus sliced almonds makes a double delicious biscotti. Odense Almond Paste adds extra flavor to this delicious chocolate cookie. A rich almond filling topped with sweet fig preserves and surrounded by a crisp crust make the perfect combination of flavors and texture. Bake 2 galettes at once, because everyone will want seconds. This rich classic Danish cake is a breeze to make with Odense Almond Paste. Delicious alone or covered with your favorite topping. This elegant dessert is good any time of the year. Odense Almond Paste makes a sweet frangipane that is a delicious and complementary filling for tart Granny Smith apples. This classic chocolate pie has a surprise layer of Almond Paste for the almond lovers in the family. Odense Almond Paste adds a firm texture and rich flavor to this sweet almond crust. It’s hearty and goes well with any fruit pie, especially hand pies. It’s the perfect picnic dessert. No forks or plates to bother with … just pick one up and go! Get out your pizza pan to make this delightful fruity tart. Odense Almond Paste and grated orange peel give a sweet, citrus flavor to this tasty crust. These vegan cookies were developed by blogger Chocolate Covered Katie. We thank her for this soft almond middle chocolate chip cookie. If you like almond paste and chocolate combinations, this cookie is sure to please. These delicious bars are great for on-the-go snacking. The flavor from the grilled pineapple combined with dark rum and Odense Almond Paste sets this cake apart from all other upside down cakes. ‘If you can’t stand the heat, get out of the kitchen’ and grill a galette! Odense Almond Paste makes a sweet layer of flavor that complements the berries in this extra easy and delicious pastry. It keeps you and the kitchen cool! Mixed nuts with Odense Almond Paste and rich brown sugar filling make a tantalizing combination. Our Almond Paste is the best you can buy. Get a behind the scenes look at how Odense Almond Paste is made. These individual servings of bread pudding are perfect for a brunch. We used diced Odense Almond Paste, apples, and cinnamon raisin bread for a flawless combination of flavors. The convenience of a cake mix with the flavor of Almond Paste and Baileys Irish Cream create one easy but sophisticated tasting cake. We've replaced the mashed potato in this old fashioned candy with Almond Paste for a fantastic flavor. Irish whiskey and Odense Almond Paste make an extra rich and flavor filled pound cake. Cheese Danish takes on a new, refreshing flavor when combined with lemon and Almond Paste. The old fashion cupcake has become the newest rage! The tart taste of lemon combined with the sweet, richness of Almond Paste make a super moist and flavor-filled cupcake. They are perfect for any picnic or party. Almond Paste complements the tart lemon and nutty poppy seed flavors in this rich tasting, festive cake. It's perfect for any occasion. These tasty cookies are a rich blend of lemon and almond. This is one of the easiest cookies to make from scratch! Almond macaroons are a hundred year old Scandinavian tradition. Maple Syrup and Odense Almond Paste create a delicate but marvelously flavored pumpkin bread! This sinful chocolate cheesecake gets a little help from Odense Almond Paste. These delicate almond cakes are the perfect finger food for any party or buffet. Odense Almond Paste makes it impossible to eat just one of these delightful raspberry tarts. 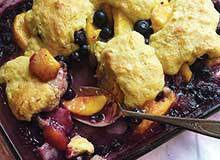 Summer fruit, packaged biscuit mix and Odense Almond Paste produce a cobbler that is as delicious as it is easy to prepare. We thank Nancy from Maine for this fantastic cookie. Odense Almond Paste makes them crisp on the outside but chewy on the inside. Serve them plain or sprinkled with colored sugar for a festive touch. Oatmeal and Odense Almond Paste make a dense and rich cake. Oats and Odense Almond Paste make a fabulously rich and chewy oatmeal cookie. We bet ‘you can’t just eat one’. These wedges are a tasty cross between shortbread and an oatmeal cookie. The addition of Almond Paste and oats gives them a slightly chewy texture. They make a great dessert or hostess gift. Orange zest and Almond Paste are combined with mini chocolate chips for a rich and moist holiday dessert that will feed a crowd. Odense Almond Paste and grated orange rind give these tender scones refreshingly citrus and nutty flavors. The addition of Odense Almond Paste, orange rind and chips makes this our all-time favorite biscotti. It’s great for any occasion or any time of the year! With fresh fruit of summer or frozen fruit in winter, this cobbler is always in season. Odense Almond Paste and buttermilk create a tender and flavorful biscuit topping. We made a buttery homemade crust for a special treat, to complement the fresh fruit filling and Odense Almond Paste. A traditional peach cobbler with the added surprise of a delectable almond buttermilk biscuit. This cinnamon Almond Paste filling transforms ordinary refrigerated rolls into an extraordinary treat. They are a special, but easy addition to holiday brunches. Festive cutouts give a sneak preview of the raspberry layer between delicate almond dough. If you like Almond Joys, you will love these pretty cookies. These indulgent cookies make delicious after dinner treats! Enjoy them with a glass of wine or almond liqueur. Odense Almond Paste and canned sweet cherries make this delicious pie easy to prepare. Odense Almond Paste enhances this quintessential combination. These bars feed a crowd and are perfect for picnics! Almond Paste complements the fresh flavor of strawberries, and the tart taste of rhubarb. This muffin will be a welcome addition to any breakfast or brunch. This upside down almond cake is crowned with the quintessential flavors of spring. This recipe makes enough delicate yeast rolls to have some right away and still refrigerate some for the next day. Almond Paste creamed with butter and sugar gives these little breads the perfect flavor. This cardamom flavored coffee ring is filled with Odense Almond Paste and cinnamon, giving it an old world flavor. As in any yeast bread, it takes time to make but it is SO worth the effort. These pretty rings are especially festive for any holiday brunch or special occasion. We made this classic Southern pie dairy-free by using Andre Prost Coconut Milk and gave the ginger snap crust a tasty twist by adding grated Odense Almond Paste. The Almond Paste in this berry delightful pie sweetens tart cherries and blackberries. This Swedish cake is made extra rich with Odense Almond Paste. The cake is crowned with a stunning caramelized almond topping. These classic cookies are also known as Neapolitans or Rainbow Cookies. Made with Odense Almond Paste for extra richness; they are as beautifully festive, as they are delicious. The extra steps are worth the work. Traditionally made with peanut butter, we updated the recipe with almond butter and Odense Almond Paste. Almond liqueur makes this a grown-up treat. Sweet Almond Paste complements tart berries in this wonderful summer muffin.